The Country Catalogue | Blog | Waxed or What? Waxed jackets, love them or hate them, are an icon of the countryside and traditionally worn by farmers and gamekeepers alike. Waxed cotton was originally used by the sailing industry in the 19th century. At that time, fabric was coated with linseed oil and woven into sails at a mill in Scotland. By the 1930s a new process of impregnating the cotton fabric with paraffin oil had been developed. The fabric was woven in Scotland, dyed in Lancashire then taken to London to be cupro-ammonia treated before being sent back to Lancashire for the wax treatment. This disadvantage of the cupro-ammonia treatment was that the colour of the waxed cotton varied according to how much copper remained after the treatment. Black was fairly consistent but the dark olive varied a lot. It was because of this that the traditional corduroy collar on waxed cotton jackets was usually a co-ordinating dark brown, as matching the olive colour would have been tricky. A new technology, refined hydrocarbon wax, was developed in 2005 to replace the cupro-ammonia treatment. This new technology eliminated the smell often associated with waxed jackets. Today, this water repellent material is turned into clothing, including waxed jackets and waxed overtrousers, which can last for many, many years if cared for properly. The wax and the cotton are natural products and can lose their protective properties over time if not well looked after. Waxed jackets and other waxed clothing should be dried gently and not kept in damp places. Re-waxing should be undertaken regularly and at The Country Catalogue we sell Hoggs of Fife Professional Dressing for Waxed Cotton Clothing in a spray form, recommended to reproof and renovate your waxed jacket and other waxed clothing. Alternatively, your Jack Murphy waxed jackets can be treated with the Jack Murphy Wax Cotton Dressing which The Country Catalogue stocks in a 200ml tin. Waxed jackets are wonderfully rugged and hard wearing, often becoming a long standing favourite work jacket or casual jacket. Many people love the weather-beaten and often battered look of a well worn waxed jacket which seems to get more and more comfortable as the years go by. The Hoggs of Fife Padded Waxed Jacket is a classic country waxed jacket made from extra sturdy 500gsm double folded waxed cotton. With its’ detachable hood, traditional corduroy collar and many other features it’s perfect for country pursuits. Alongside that is the Hoggs of Fife Padded Waxed Waistcoat which offers protection without the bulk of a jacket. Particularly popular with beaters and farmers are the Hoggs of Fife Waxed Overtrousers which provide excellent protection from the elements. These are generously cut as you would expect from overtrousers and are fully lined with an elasticated waist and adjustable side straps. Headwear hasn’t been forgotten and the Hoggs of Fife Waxed Baseball Cap, in dark olive with a dark brown waxed leather peak, has all year round popularity as does the Hoggs of Fife Waxed Indiana Hat. The demand for waxed clothing from Hoggs of Fife has ensured that it is kept in stock all year round at The Country Catalogue. As well as being practical, waxed can jackets can also be stylish and suitable for town or country wear. The Jack Murphy Men’s Howard Jacket is a contemporary take on the classic waxed jacket, looks very smart and, with its cosy blue fleece, is perfect for winter days combining fashion with function. New for ladies in autumn 2016 is the Jack Murphy Charlize Waxed Jacket (coming soon). In a traditional olive green, the Jack Murphy Charlize Waxed Jacket is made of British waxed cotton and is shower resistant. With its’ detachable faux fur collar it’s a stylish yet practical waxed jacket. That really brings us back to the question, Waxed or what? Over the last 50 years or so, synthetic fabrics have developed hugely, giving the consumer an even wider choice of waterproof shooting jackets, casual country jackets or country work jackets to rival the more traditional waxed jacket. At The Country Catalogue we offer you the choice of both waxed jackets and waterproof jackets featuring the most up to date fabrics, features and waterproof membranes. Should you decide against a waxed jacket and need an alternative we have various suggestions. If you need a men’s work jacket or beating jacket then the Lavenir Jacket is a good option instead of a waxed jacket. Hardwearing and waterproof it ticks all the boxes for a beating jacket or a work jacket. For something a bit smarter consider the Baleno Derby Jacket, which also has matching Baleno Derby Trousers, or the Seeland Kensington Jacket which again has matching Seeland Kensington Trousers. If your waxed jacket is a casual country jacket and you’re looking for something different, then the Baleno Hatfield Jacket could be the one for you. 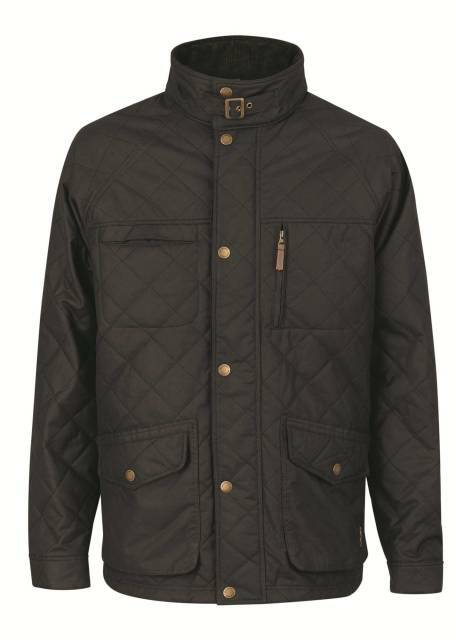 Showerproof and in a soft diamond quilted fabric with a contrasting trim, the Baleno Hatfield Jacket provides a casual look for either town or country wear. For ladies wanting an alternative to a waxed jacket, the Seeland Ladies Exeter Jacket or the Hoggs Ladies Hunting Jacket are waterproof and practical jackets. We also offer matching Seeland Ladies Exeter Trousers. Hopefully, that answers the question of Waxed or what?